SGT Sherri Gallagher captured her first NRA High Power National Championship by firing an incredible 2396-161X, a new record score! Competing at Camp Perry, Ohio, Sherri dropped just four points out of 2400 (240 shots). An amazing 67% of Sherri’s shots were Xs. Congratulations Sherri! Carl Bernosky was second, just one point behind, with a 2395-140X. Carl and Sherri BOTH shot scores well above David Tubb’s Championship Record of 2389-138X, a record set in 2003. Congratulations to Sherri, Carl and all the outstanding shooters in this year’s competition. 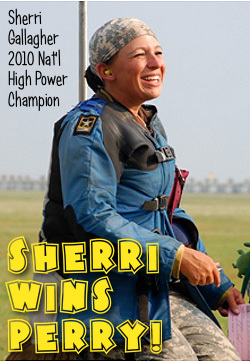 Sherri is now the second-ever female winner of the NRA National High Power Championship. The first female High Power Champion was Sherri’s mother, Nancy Tompkins, who won in 1998. It’s all in the family, we guess…. This was an especially sweet victory for Sherri, who had the 2009 Championship slip from her grasp. In last year’s NRA High Power Championship, Sherri was leading the field comfortably, shooting at a record pace, only to suffer a cross-fire which dropped her out of contention for the Championship. That cruel 2009 crossfire is now forgotten as Sherri finally earns the National title she richly deserves. Hardware UPDATE: We are informed that Sherri’s T2000 match rifle was chambered in .260 Remington, and she shot that cartridge at all distances in the High Power Championship. We’ll try to get more load data soon. Share the post "Sherri Wins Perry! 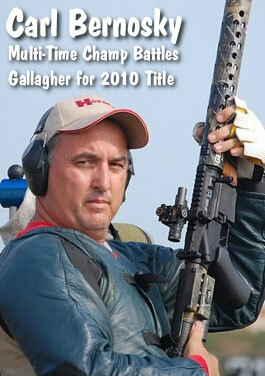 Gallagher is 2010 NRA National HP Champion"
Update from Camp Perry: Today is the final day of the 2010 NRA High Power National Championship. SGT Sherri Gallagher of the USAMU remains just one point ahead of 9-time National Champion Carl Bernosky. The hardware battle is interesting — Sherri’s Tubb 2000 Bolt Gun vs. Carl’s AR-platform rifle shooting a 6mm Hagar. Carl’s first (and perhaps best) chance to catch Sherri came in the Crescent Cup match this morning. With the entire Crescent Cup event shot standing at 200 yards, this was Carl’s great opportunity to tie Sherri, or even pull ahead. The standing position is one of Carl’s strengths — he is considered one of the best standing position shooters in history. But Sherri matched Carl shot for shot and they both finished with the same 199-4X score. So Sherri has maintained her one-point margin. If Carl and Sherri end up tied at the end of the day, Sherri will win the High Power National Championship because she has a huge X-count edge. But right now either Carl or Sherri could end up on top of the Podium. Share the post "Sherri and Carl Battle Down to the Wire in NRA High Power National Championship"
Ultra-portable mini-reloading scales have become popular with shooters who reload at the range. These can be small enough to fit in a shirt pocket. While not as precise as a bench-top unit, they can deliver read-outs to within 0.2 grains. 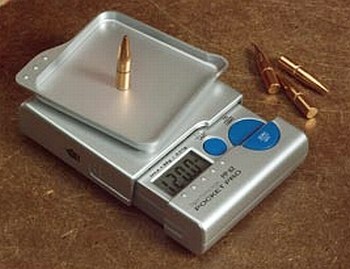 These ultra-compact scales should prove very useful for any shooter that needs to load at the range. Additionally, they are affordable enough to be used as a back-up to a larger electronic or balance beam scale. Two models, one from MTM and the other from Acculab (Sartorius) have caught our attention. NOTE: We haven’t yet been able to comparison-test these two scales with a laboratory scale to confirm the claimed levels of weighing precision and see if there are any serious calibration or “drift” issues. But we’ve heard no negative reports. 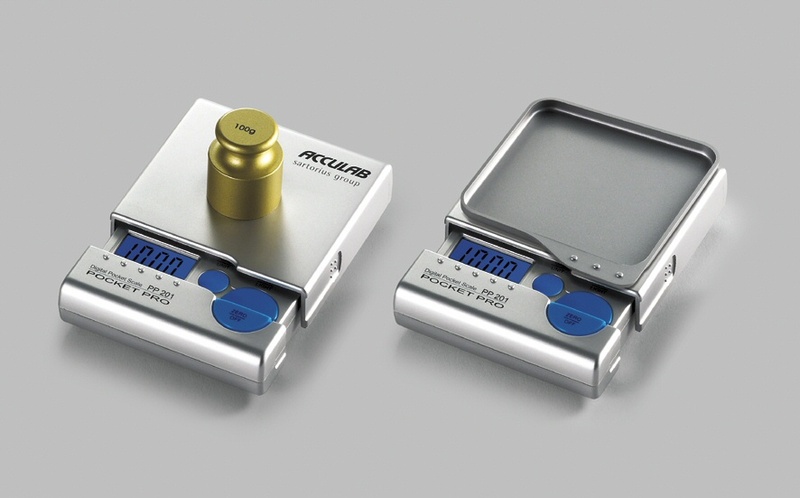 Sartorius, makers of the popular Acculab-123 scale and its Denver Instrument clone, the MXX-123, has introduced a new, portable reloading scale that is truly pocket-sized. The compact model PP-62 will work as a portable scale or a back-up for a benchscale. It measures 3.5″ long, 3″ wide, and just 7/8″ thick. The Pocket Pro can handle a maximum weight of 1000 grains. 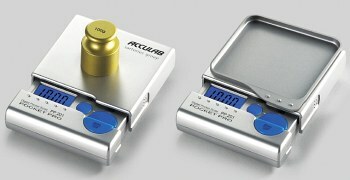 Acculab claims resolution down to 0.1 (one-tenth) GRAM, which provides readability to 0.20 GRAINS. We like the fact that the unit runs on a single, easy-to-purchase AA battery. Battery life is up to 20 hours, if you turn off the back lighting on the LCD display. A sliding cover also protects the weighing mechanism during transport. The PP-62 offers easy one-button calibration with the supplied check weight. Sinclair Int’l sells the new Acculab PP-62, for $119.95 (Item 10-6200). 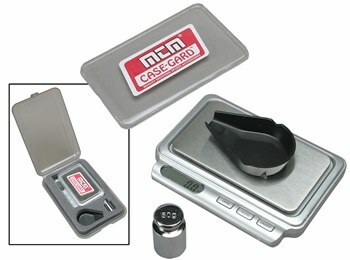 This includes battery, weighing pan, and 50 gram calibration weight. ScalesGalore.com offers the PP-62 (with battery, pan, and check weight), for $109.95. 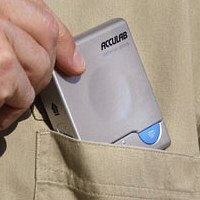 CONSUMER ALERT: On the web you’ll find other versions of the Acculab Pocket-Pro® Scales, priced at $45-$60.00. These are the PP-201 (photo below) and PP-401. Though these scales appear identical to the PP-62 (Sinclair item 10-6200), they are NOT the SAME. The cheaper PP-201 and PP-401 are only rated to one-TENTH of a GRAM. The PP-62 is RATED to one-HUNDRETH of a GRAM — roughly 0.2 GRAIN precision. Share the post "Pocket-Sized Scales for Reloaders"
There were many great performance by American female shooters at the recently concluded 2010 ISSF World Championships in Munich. Led by Olympian Kim Rhode, our lady shotgunners got most of the media attention, but two junior smallbore shooters also deserve mention. 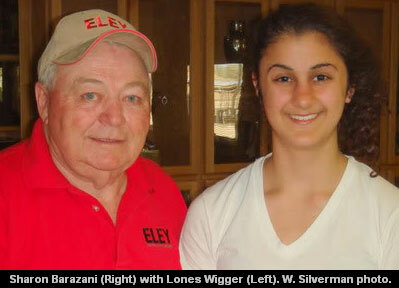 Sharon Barazani of Rossmoor, CA won the Gold Medal in the 50M Prone women junior event with a 596-46X score. Fellow American Sarah Beard (from Danville, IN) scored a 594-44X to finish second and earn the Silver Medal. The performances of both Barazani and Beard are particularly impressive because neither young lady had previously competed in an ISSF World Cup or World Championship event. In addition, Sharon managed to win the Gold without any sponsorship from USA Shooting. Sharon funded her own expenses to compete at the World Championship. That involved saving many pennies over the past few months but now she came back with gold. At right, Sharon is shown with legendary Olympic shooter Lones Wigger. Share the post "American Junior Women Win 50m Prone Rifle Gold and Silver"